A FINAL for the ages? Anything but. A day of champagne football? More like a flat pint finale. But a tactical masterclass from Éamonn Fitzmaurice? Well, hard to argue. We had come to Croke Park expecting a fascinating strategic duel between Donegal - masters of the blanket defence and the counter-attacking breakout - and a Kerry team supposedly in transition who have grown up incredibly fast under their smart young supremo. What unfolded was fascinating - in a grim sort of way - but it all ended with a defiant reaffirmation of some old truths. And the most telling truism of all? That when it comes to September, Kerry have an incredible knack of getting the job done, as you'd expect from a county collecting its 37th All-Ireland SFC title. But this final was equally notable for a whole host of unexpected developments. Donegal, pre-match favourites in pursuit of their third Sam Maguire, are noted for their boundless reserves of energy but the same zip was only present in flashes yesterday, something that left Jim McGuinness flummoxed afterwards. Donegal are equally renowned for their third quarter surge and yesterday, having recovered from the confidence-shaker of a Kerry goal inside 50 seconds to go in level at the break, most punters were expecting more of the same here. It never materialised - partly due to a ghoulish 52nd minute mistake from goalkeeper Paul Durcan that would prove the most decisive score of this 2014 championship. Kerry had just edged one point ahead when Durcan (an All Star cert as of 3.29pm yesterday) went for an ill-judged short kickout that was intercepted by Kieran Donaghy. In a flash, the 2006 Footballer of the Year had planted a clinical shot beyond Durcan for Kerry's second goal. Donaghy was an unused Kerry sub for their quarter-final against Galway but, ever since his late match-turning introduction in the drawn semi-final against Mayo, he has been a 'Star' reborn. Yesterday's 1-2 haul iced the cake. Yet, just to prove this final almost defied analysis, Donegal responded with three unanswered points inside the next three-and-a-half minutes, courtesy of a Paddy McBrearty brace and wandering full-back Neil McGee. 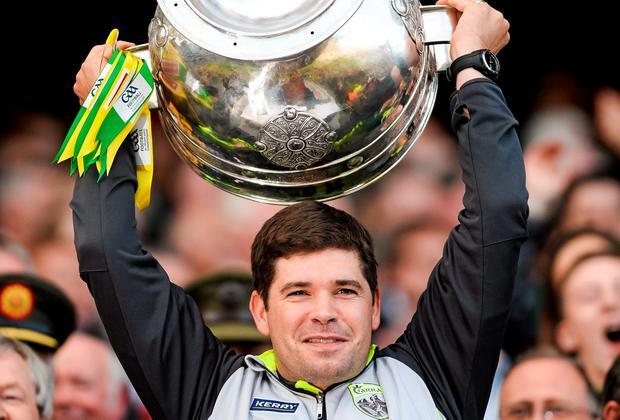 With Donegal now just a point adrift and seemingly with renewed momentum, Kerry rallied to land the next three points via Johnny Buckley's inspirational sky-scraper, a Barry John Keane free and Donaghy's fist. Finally, in a game dominated by cagey defensive set-ups on both sides, the play had opened up and Donegal points from two of their subs, Dermot Molloy and Christy Toye, cut the margin to two. Then another sub, Kerry's Bryan Sheehan, nailed a high-pressure 52-yard free with his very first touch after 68 minutes. Much of the remaining four minutes incorporated Kerry successfully playing keep-ball while a flummoxed Donegal retained their defensive shape ... until one last hurrah, deep in stoppage time. Michael Murphy initially tried to bulldoze his way through a green-and-gold wall before McBrearty's deflected shot was parried by 'keeper Brian Kerry and Colm McFadden, diving on the rebound, saw his fisted attempt at an equalising goal clip the near upright. Donegal were that close to a replay that their overall performance probably didn't deserve. Unlike in 2012, when they blitzed Mayo with those two early goals, the Ulster champions quickly discovered that this year's final would not be played on their terms. All the pre-match talk about Kerry's forward threat had focussed on James O'Donoghue and Donaghy ... if Kerry sensed that Paul Geaney could be their wild card, they were only waiting 50 seconds before the Dingle man delivered, exposing Paddy McGrath's relative lack of height with a smart catch (from Stephen O'Brien's delivery) and a sharp finish on the turn. When Donaghy pointed soon after, Kerry led by four and it enabled them to implement another key plank of Fitzmaurice's final strategy. It was obvious, not just to their streetwise manager, that Kerry were unlikely to beat Donegal by aping Dublin's ultimately futile gung-ho approach. Thus, when the Donegal half-forwards retreated, Peter Crowley and the excellent Killian Young remained planted as sentries in front of their own full-back line. Initially, as with their quarter-final against Armagh, Donegal struggled when faced by a mirror-image of their own blanket. However, as the half unfolded, Kerry had started to run out of ideas, reflected in low-percentage pot shots from distance while Donegal started making inroads of their own, shooting four of the last five points while 18-year-old Darach O'Connor, sprung for the final, came desperately close to a 25th minute goal. Still, with the half-time score reading 1-3 to 0-6, Donegal looked poised. And when Murphy edged them ahead, for the first time, it seemed a continuation of the same trend. Instead, Kerry would hit the next 1-2 and leave Donegal playing catch-up for the remainder. One final footnote: if any Mystic Peig had predicted beforehand that James O'Donoghue would be held scoreless by Neil McGee, and would still end the day as an All-Ireland winner, he or she would have been laughed out of court. But that's what transpired. This is not to say O'Donoghue had a poor day. His was actually a selfless contribution, coming deep, constantly showing for ball and trying to set up chances for others. Thus, O'Donoghue ends the year with his first Celtic Cross - and, in all probability, a Footballer of the Year gong too.